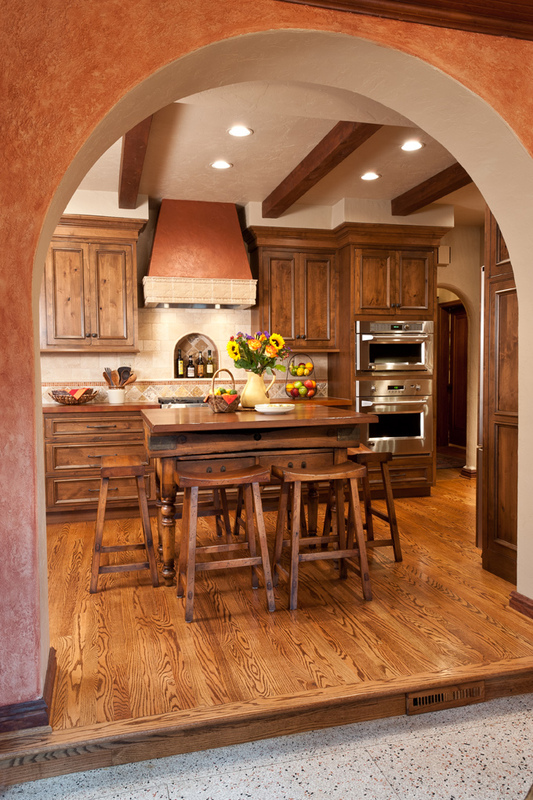 A Mediterranean makeover breathes new life into this Richmond Heights kitchen. When Tramelli started the remodeling project, size was the first obstacle to overcome. 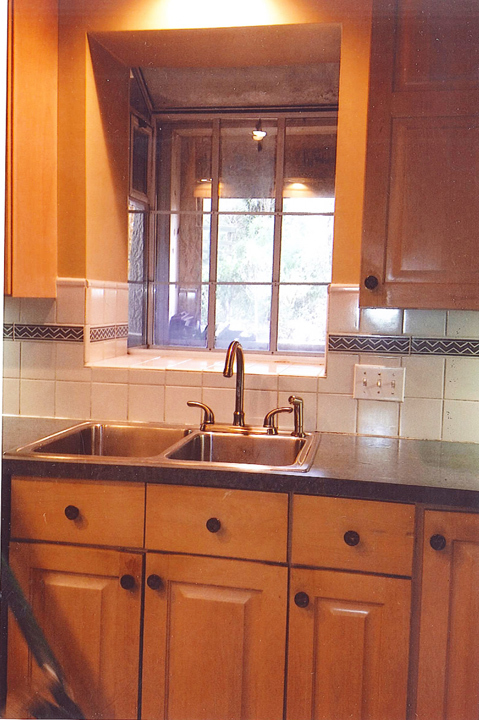 The kitchen was gutted and extended by eight feet, as far as it could go before hitting a tree in the backyard. To further open up the room, the wall between the kitchen and the adjoining breakfast room was removed. Next, it was time to give the new space a new look. In keeping with the home’s Mediterranean style, Tramelli chose architectural features that already existed in the house, such as arched openings, stucco walls, a beamed ceiling and hardwood floors. The hood over the range top was faux-painted to resemble copper. In addition, a large arched window was added above a farmer’s sink with a window box placed outside, its flowers popping up above the windowsill, just in view. "In making selections, I chose everything with an Old World feel,” says Tramelli. “The cabinets are dark brown knotty alder with added distressing; countertops are concrete with shades of terra cotta and chocolate brown; the tile back splash is cream travertine with terra cotta accents; light fixtures, hardware on cabinets and the faucet over the farmer’s sink are oil-rubbed bronze; the stucco walls are taupe, and the ceiling beams are stained dark brown.” She found Italian dishware and pottery to match her color scheme, and she repurposed an existing antique butcher block by fitting it with a new top (given an antique look, of course). 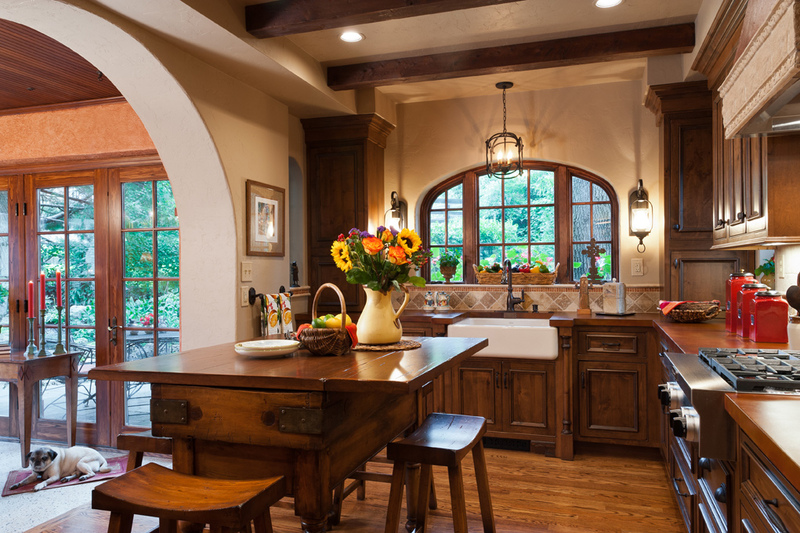 The top extends beyond the base, and barstools were paired to create an island centered in the room.